For some reason Bill got it in his head that we needed to have this "amazing" mole I had once made with his wild turkey. While I remembered making it, I had no idea how I made it the first time. My plan was to just follow a recipe, however traditional moles call for an assortment of dried chili peppers which I couldn't find at my grocery store. So I'll start out by saying that this is not a "traditional" mole but an improvised experiment. 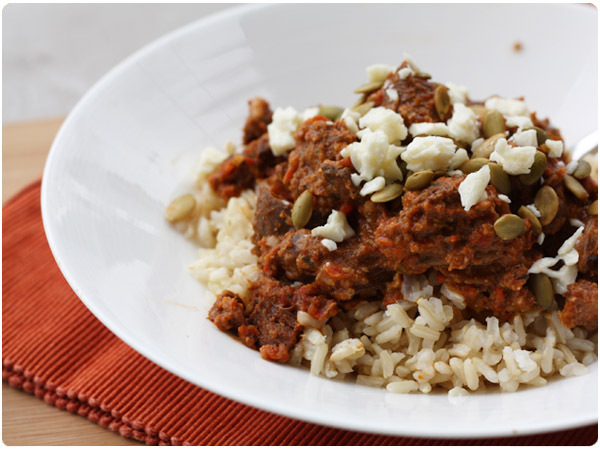 It uses a lot of ingredients and is not a "quick" meal per se, however since the slow cooker is doing all the work on the turkey you'll only need to make the sauce - which is mostly just blending things. It's a good way to use the tough turkey leg meat and a good hearty meal for a lazy fall afternoon of watching football. Remove skins from legs. In a small bowl, combine chili powders, salt and garlic powder. Pat spice mix onto meat and place into a slow cooker. Cover with tomatoes and chicken broth. Cook on low heat for 6-8 hours or on high heat for 4-5 hours until meat is tender and falling of the bone. Line a baking sheet with aluminum foil. Slice peppers in half, removing stems and most seeds (all seeds if you're afraid of spice). Place peppers on foil and broil for 5-7 minutes until they are charred but not burnt through. Let cool and peel off charred skins. Place in saute pan with a little oil and continue to cook/char until peppers are soft. Remove from pan and set aside. In a blender, add almonds, pepitas, cinnamon, cloves, allspice and oregano. Blend until nuts are finely ground. Next, in the same saute pan, saute onion and garlic in 1 Tbsp of olive oil. When they begin to soften, add remaining canned tomatoes and grape tomatoes. Continue cooking until grape tomatoes begin to split and onion is soft. Add to blender and puree. Add roasted peppers and chicken broth and continue to puree until mixture is smooth. Transfer to a sauce pan and warm over med-low heat. Add chocolate chips and 1/4 C of liquid taken from the slow cooker. Stir until chocolate is melted. Season lightly with salt. Place shredded turkey into the saute pan and coat with sauce. Stir well to combine and heat over low just to warm. 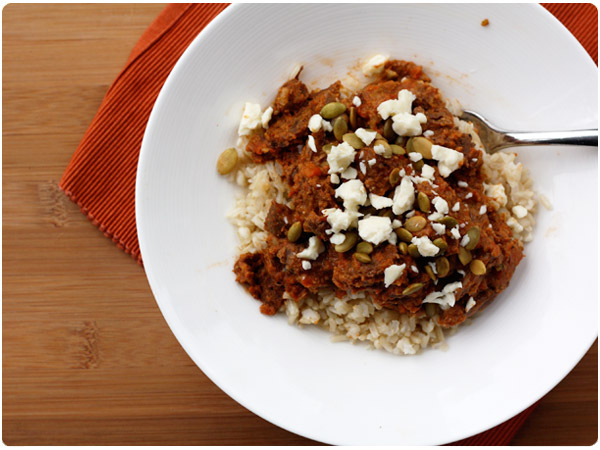 Serve with brown rice, cotija cheese and extra pepitas. This looks seriously good – what perfect autumnal food, delicious.